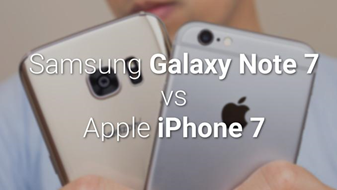 The Galaxy Note 7 was released a while back, whereas the iPhone 7 Plus has less than a month since it’s on the market. While the Note 7 has had time to win over users with its functionality and specs – ignoring the battery issues – the iPhone 7 Plus is still a relatively new phone, but we’re sure that it already has its fanbase. There are a number of similarities and differences between the two devices which we will look at. While the iPhone 7 Plus is using the A10 processor, famous for its need for a lot of battery power, the Samsung Galaxy Note has the Exynos Octa 8810. Both these central processing units are the latest in the field and ensure high speed functionality in the devices. The Galaxy Note 7 has 4 GB RAM and 64 GB internal memory with the option to expand through micro SD card at up to 256 GB. This was a milestone for devices because combined the phone would have well over 300 GB of storage which is a whole lot. The iPhone 7 Plus on the other hand has 3 GB of RAM and 32, 128 and 256 GB of internal memory storage, but without the option of adding a microSD card. The Galaxy Note 7 is using a 5 MP front facing camera and a 12 MP primary camera with OIS. It also has the iris scanner which was also a milestone, as other devices have not entirely embraced the use of the iris scanner and are still dependent on the fingerprint scanner. Like the Note 7, the Apple’s phablet does have a fingerprint scanner, for unlocking your iPhone 7 Plus and other operations, but it does not have the iris scanner which makes transactions via a device more secure. It similarly has a 5 MP front facing camera and a Dual lens 12 MP primary camera with OIS. The Galaxy Note 7 blows the iPhone 7 Plus out of the water with its S-Pen Capacitive Stylus and IP68 Water and Dust proofing. The iPhone 7 Plus also holds one over the Note 7 with the inclusion of a smart connector which is more suitable for power users as it allows connectivity with keyboards via Bluetooth. It is also a step higher , thanks to the 3D Touch function. Each of these phablets has their advantages over the other. Therefore, it’s pretty hard to decide upon the best one, because, in the end, it’s a matter of personal taste. After all, it’s the best Android and iOS can offer right now, so choosing one would be like picking between Pepsi and Coke.